The first pigment used by Seurat in A Sunday Afternoon on the Island of La Grande Jatte that I created a drink from was vermilion, a mostly red (not mostly-dead) color with slightly more green than blue (hex value #E34234 for the web developers playing at home). Shake and strain into a coupe. As this was my first paint color drink, and I was oh so young and naive, I started with a colorless base spirit in the Silver Whiskey (High West Western Oat), which is unaged so doesn’t take on the coloring you get from the barrel aging process. This was a mistake in retrospect as I got to later colors that couldn’t use a brown spirit base, which this could have used, but you must forgive my youthful transgressions. I added the Chambord for the sweetness and tried to balance this with Ramazotti for something bitter (and the right color) and the lime juice for some acid — it also helped to add a little green to the color, which was becoming too purple. 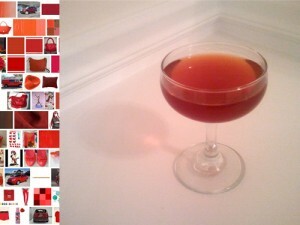 The Peychaud’s, I am forced to admit, was a cheat to get the color just where I needed it (I used it again in the next drink for the same reason; it feels good to come clean). Nothing too off the wall in this one, and it was darn tasty. And the color looked like a drink I’d want to consume (have I mentioned the blue drinks yet? )!